It might seem hard to bake in very hot weather, but it’s possible to bake light cakes that are bursting with seasonal fruit and highly nutritious. Regula shares a yummy recipe for a moist gluten-free cake filled with the classic flavours of apricots and almonds. 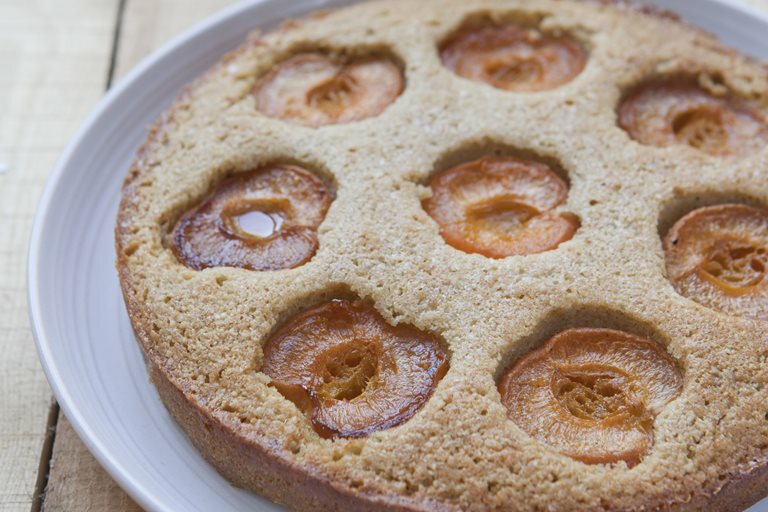 This gluten-free cake recipe is made with almond meal and a little bit of buckwheat flour, topped with gorgeous apricots which are a perfect match with almonds. And for those who are watching their glycemic index, almond meal is low in carbohydrates, sugars and high in protein. The cake is moist and has a pleasant crumb with a delicate nut flavour coming from the almond meal. The Romans first brought the almond tree into England and the nuts have been used in cooking throughout history especially in the early 16th century where almonds and almond meal were very popular and used to make marchpane or marzipan to decorate the elaborate banquets. Transfer the dough into the prepared cake tin, press down the apricot halves into the dough and put in the preheated oven for 60 minutes or until golden.